"The Role of Professionalism in Health Care: Essential Elements, Perspectives, and What's at Risk"
This year's theme encourages participants to consider the main components of professionalism in any health care field from various perspectives with a focus on why professionalism matters, or should matter, in health care. 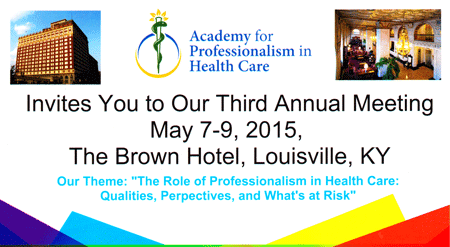 The 3rd Annual Academy for Professionalism in Health Care (APHC) Conference will be held May 7-9, 2015. This activity has been planned and implemented in accordance with the Essential Areas and Policies of the Accreditation Council for Continuing Medical Education (ACCME) through the joint providership of the University of Louisville and Academy for Professionalism in Health Care (APHC). 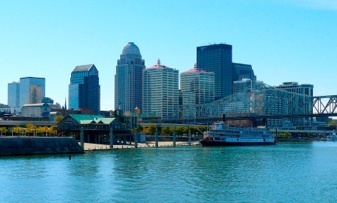 The University of Louisville is accredited by the ACCME to provide continuing education for physicians. The University of Louisville Office of Continuing Medical Education & Professional Development designates this live activity for a maximum of 13.25 AMA PRA Category 1 Credit(s)™. Physicians should claim only the credit commensurate with the extent of their participation in the activity. Nurses - This program has been approved by the Kentucky Board of Nursing for 15.9 continuing education credits through University of Louisville Hospital, provider number 4-0068-7-16-861. The Kentucky Board of Nursing approval of an individual nursing education provider does not constitute endorsement of program content.